Talked about by both major parties in the 2016 Presidential Election and supported by new and old non-partisan efforts in cities and states around the U.S., criminal justice reform seems to be one of the only major political issues that unites America right now. 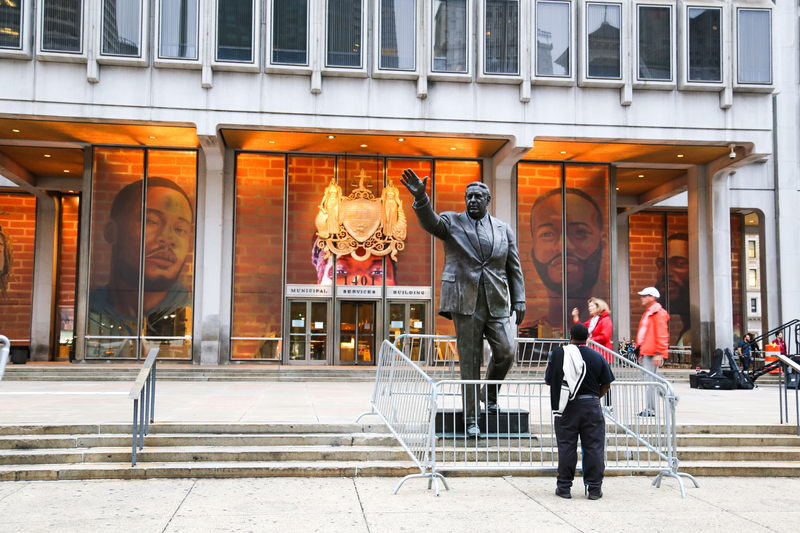 And this month, a new temporary criminal justice-themed interactive public art installation popped up in Thomas Paine Plaza at 15th street and JFK boulevard across the street from Philadelphia’s City Hall. 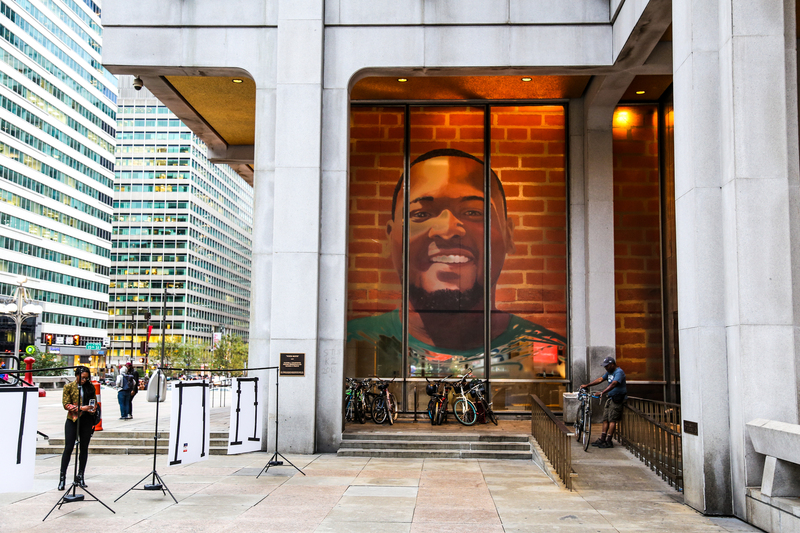 From artists Jesse Krimes and Russell Craig, created with the support of Mural Arts Philadelphia, the installation seeks to encourage public thought and discussion around criminal justice reform. 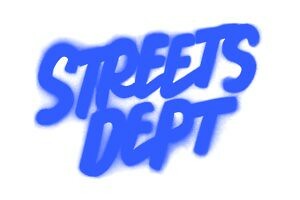 There’s no doubt that our criminal justice system is broken. And if you’re unsure of that for any reason look no further than this fact sheet from the NAACP that highlights unjust incarceration trends in America, including how our current system disproportionately effects black and brown communities. 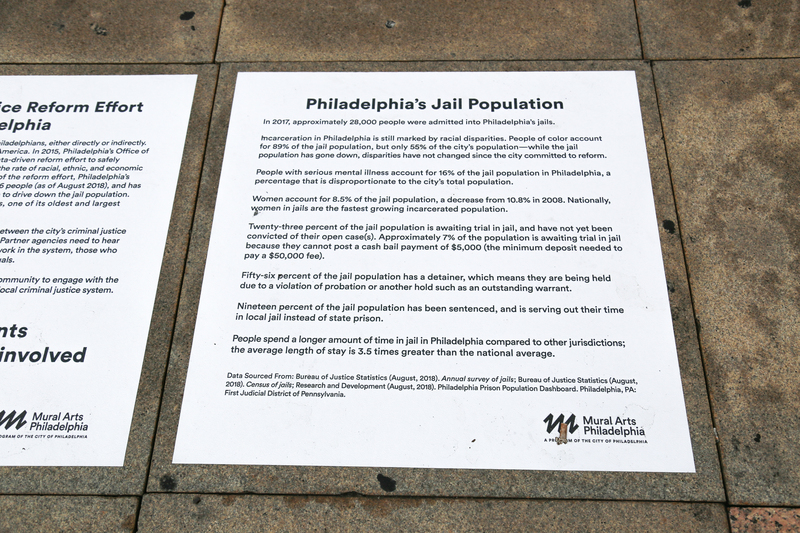 Click on the first photo below to read some specific statistics about Philadelphia’s jail population that is displayed along with Jesse and Russell’s installation. 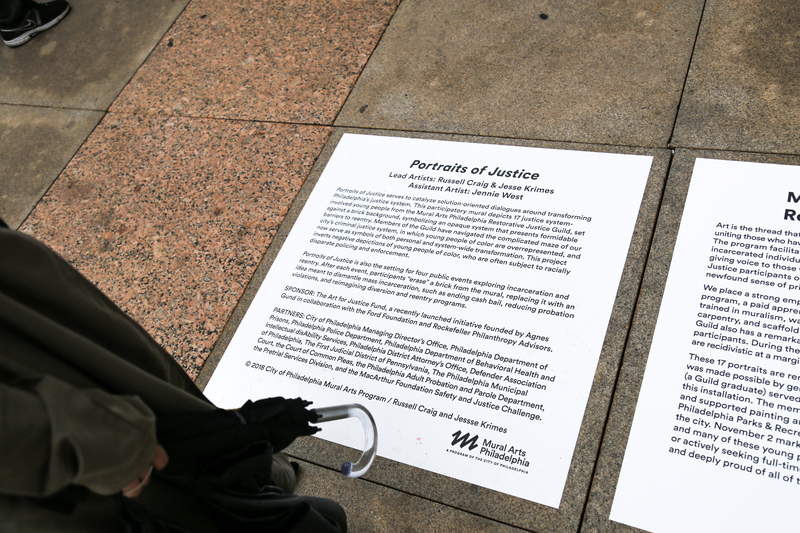 Portraits of Justice, the installation by Jesse Krimes and Russell Craig at Thomas Paine Plaza, seeks to engage Philadelphians and visitors alike in solution-oriented dialogues around the injustices of the criminal justice system. 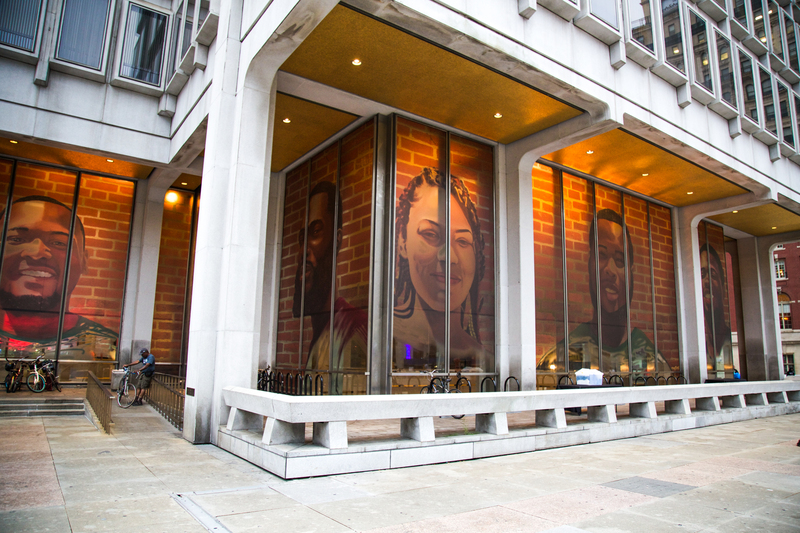 The semi-transparent window mural is visible during the day and glows at night, and it depicts portraits of 17 young men and women from the Mural Arts’ Restorative Justice Guild program. 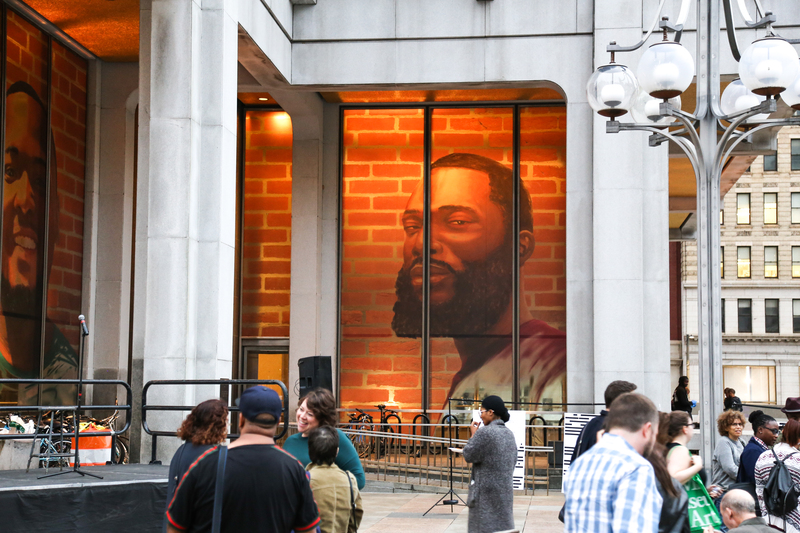 The mural’s brick background, symbolizing barriers to reentry, will slowly be erased over the duration of the project by those who check out the installation and want to participate by adding potential solutions to these issues in the place of a brick. 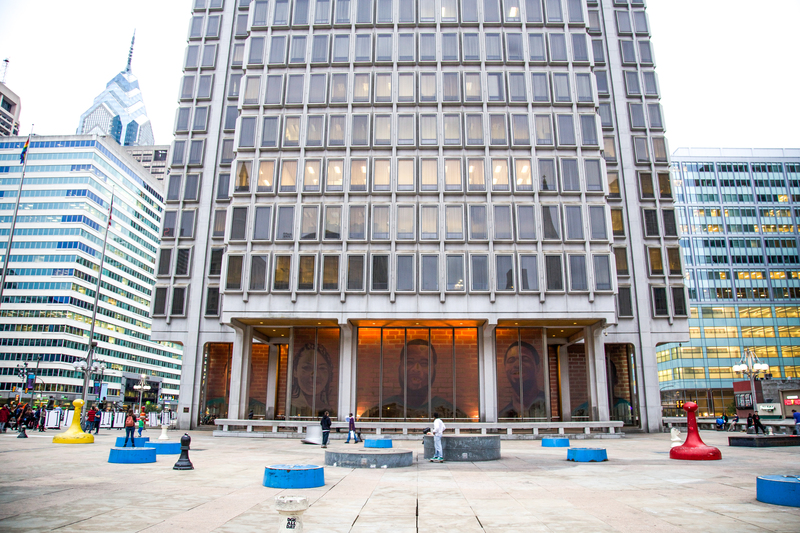 As of now there’s no word on how long this installation will be up, but if it’s anywhere near as beloved as Al-Bustan Seeds of Culture and Wendy Ewald‘s An Immigrant Alphabet installation that got renewed twice past its original end date at Thomas Paine Plaza last year, I have a feeling this will be up for a while! 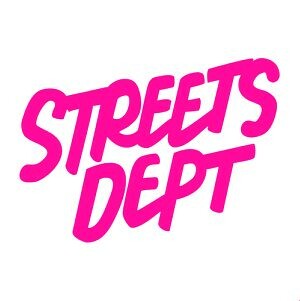 Click here to learn more about this project and how it came to be on Mural Arts’ website.